The traditional method is open surgery to replace the segment of artery. This involves a cut on the abdomen and the dilated segment of the artery is replaced with a tube made of Dacron, a type of nylon. Skiing jackets are made of a similar material. The operation does put a degree of strain on the major organs such as your heart, lungs and kidneys which can lead to complications. However the overall results are excellent (>95% success rate) and it allows you to go back to a completely normal life. Generally for the open operation the in-hospital stay is about 7-10 day while for the EVAR it is 2-3 day. 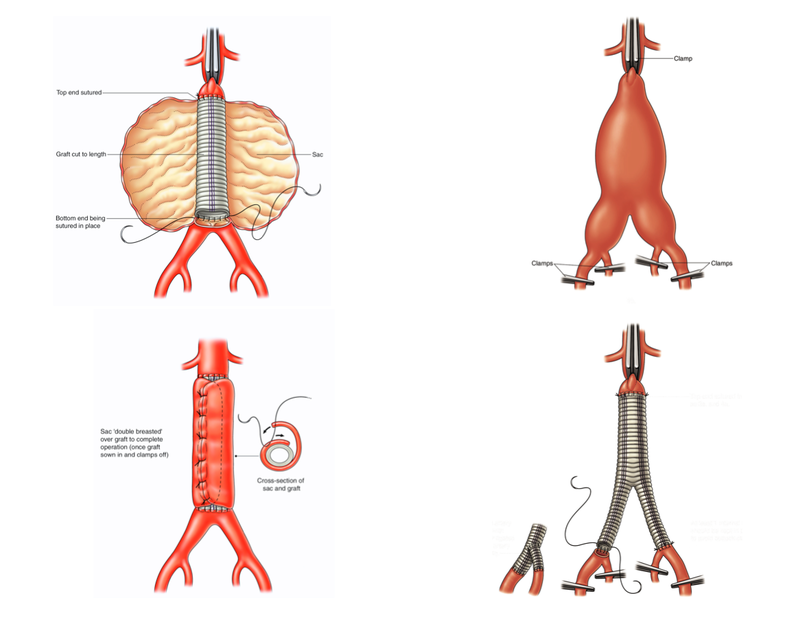 The modern technique is keyhole surgery or endovascular repair (EVAR), which involves stenting. Small cuts are made in the groin to expose the femoral arteries. A needle is inserted into the artery followed by a wire. The stent-graft, which is enclosed in a sheath, is threaded over the wire. The sheath is then extracted leaving the stent-graft to open up. A second module is inserted from the opposite groin. The stent graft forms a seal in the normal artery above and below the aneurysm, so the weakened wall of the aneurysm is not subjected to the pressure of blood flow. This ensures the aneurysm does not rupture. While the risk of complications is much less than open operations, 1 in 5 of these will need further treatment in the future. Hence you will need a scan every year to ensure it is continuing to work well. Most people recover from an EVAR in about 2-3 weeks while the open repair takes 6-10 weeks. The best treatment for you will be planned after a CT scan of the aneurysm. We will also take into account your general health. We have a vast experience in treating aneurysms with both techniques with excellent results.